FBP2 antibody LS-C175820 is an unconjugated mouse monoclonal antibody to human FBP2. Validated for ELISA and WB. 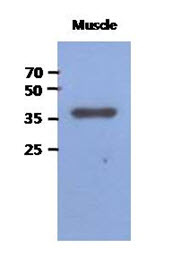 FBP2 antibody was raised against recombinant human FBP2 (1-339aa) purified from E. coli. Can be stored at 4°C. For long term storage, aliquot and store at -20°C. Avoid freeze-thaw cycles. Western Blot: The extracts of Mouse muscle (40 ug) were resolved by SDS-PAGE, transferred to PVDF membrane and probed with anti-human FBP2 antibody (1:1000). Proteins were visualized using a goat anti-mouse secondary antibody conjugated to HRP and an ECL detection system.